(Photo courtesy of John Portman & Associates, via Salt Lake City) Rendition of the street view of the new convention center hotel to be built at the northwest corner of 200 South and West Temple in Salt Lake City, adjacent to the Salt Palace Convention Center, as seen looking northeast. 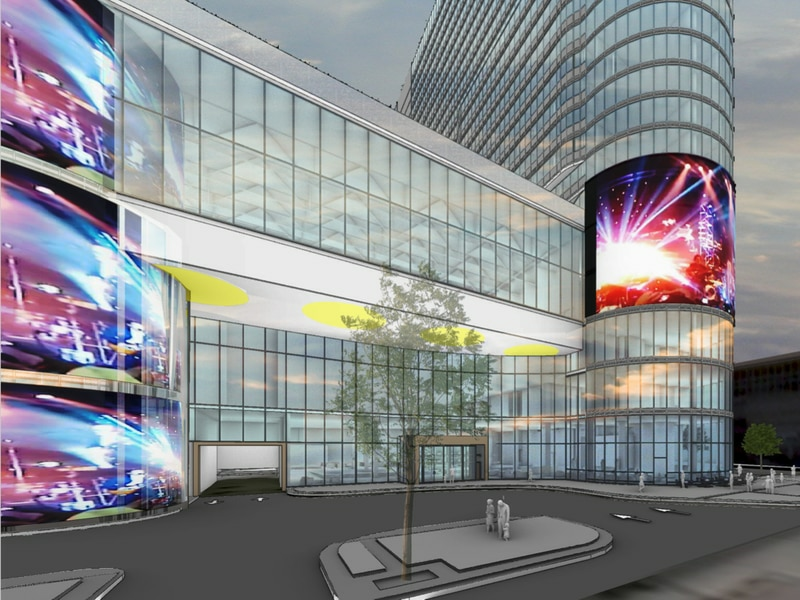 The hotel is to feature two digital screens projecting images toward 200 South. Scheduled to open in spring 2022, the hotel will be woven into the southeast corner of the Salt Lake Palace Convention Center on 200 S. West Temple, according to preliminary plans under review at City Hall. Its design echoes the Salt Palace’s distinct cylindrical towers with curved ends on the hotel’s vaulting guest room tower, while its spacious ground floor lobby, restaurant and corner market on 200 South will seek to bring a sense of around-the-clock vibrancy to the downtown area. The $337 million project, backed by Salt Lake County and two private developers, will “become a true urban complement to the downtown and a center of activity for the neighborhood,” the designers say. 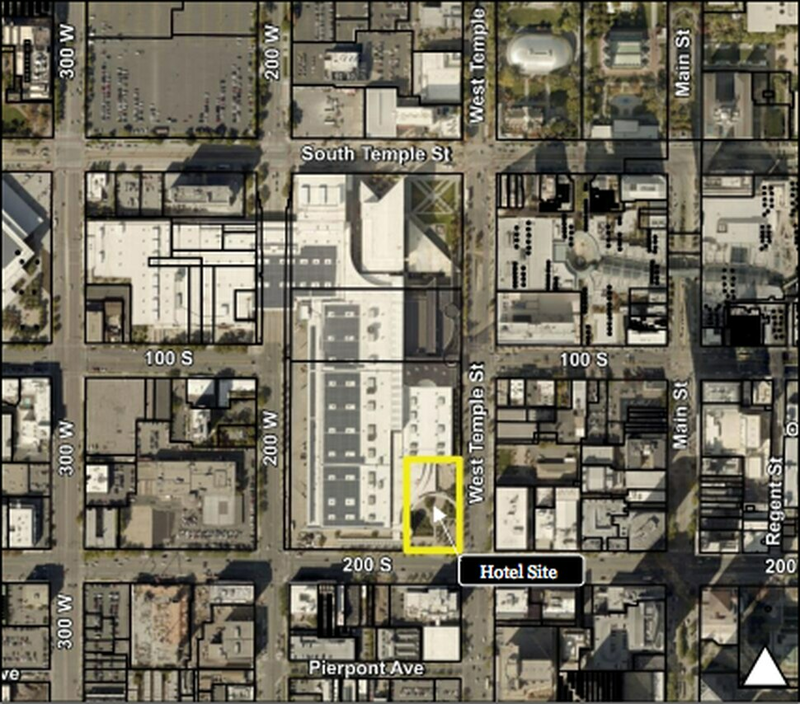 (Photo courtesy of John Portman & Associates, via Salt Lake City) A rendition of the new convention center hotel to be built at the northwest corner of 200 South and West Temple in Salt lake City, as seen looking northeast from 200 South. And with its 25,852-square-foot ballroom, copious meeting rooms and rooftop garden area, the new 616,000-square-foot hotel tower is meant to anchor what government and business officials hope will become Utah’s new magnet for big conventions that draw thousands of visitors. “The economic vision will be complemented by an elegant urban and architectural design that is compatible with the surrounding buildings while sensitive to becoming a new urban marker and presence on the skyline,” one of the project’s developers, John Portman and Associates in Salt Lake City, wrote in city documents. State, county, city and economic-development officials have pushed for more than a decade to build the convention hotel, based on several studies indicating a new hospitality center with large blocks of rooms and a spacious-enough meeting place would help Utah’s capital host more large conventions and events. One previous attempt to construct the facility fell through in 2015, when Utah officials pulled out of talks with Dallas-based Omni Hotels & Resorts after they failed to agree on public financing. 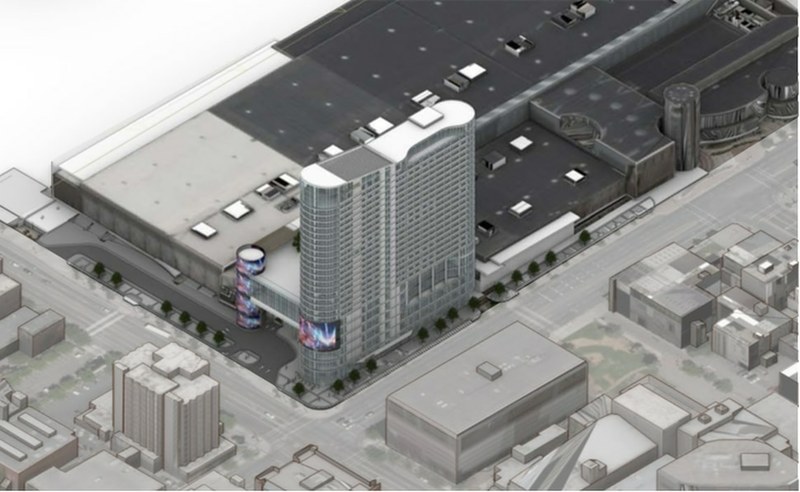 (Photo courtesy of Salt Lake City) The new Salt Lake City convention center hotel would be located at the northwest corner of 200 South and West Temple, built into the existing Salt Palace Convention Center. The hotel is being built through a partnership between Salt Lake County and development companies Portman Holdings and DDRM. The latest deal between the county, Portman and Ivins-based DDRM was clinched in November after months of negotiations, including the promise of up to $75 million in post-construction tax rebates for the two firms spread over 20 years. Shipping containers turned into an affordable apartment building? A Salt Lake City company plans to make it happen, but obstacles remain. The new hotel’s design is being studied by city planners, based on the developers’ application for the tower to be 335 feet tall. Although a recently tweaked city zoning ordinance allows for buildings as high as 375 feet in that downtown area, anything above 120 feet triggers a site-design review to make sure it complies with other zoning rules. In its plan application, John Portman and Associates said the direct connection between the hotel lobby and public spaces inside the Salt Palace will help connect the project more closely with the wider downtown. (Photo courtesy of John Portman & Associates, via Salt Lake City) An aerial rendition of the new convention center hotel to be built at the northwest corner of 200 South and West Temple in Salt Lake City, adjacent to the Salt Palace Convention Center, as seen looking northwest. Echoing similar features in the lobby of 111 Main and covering the clock tower at The Gateway shopping center, the convention hotel will boast huge digital displays on either side of its lobby. 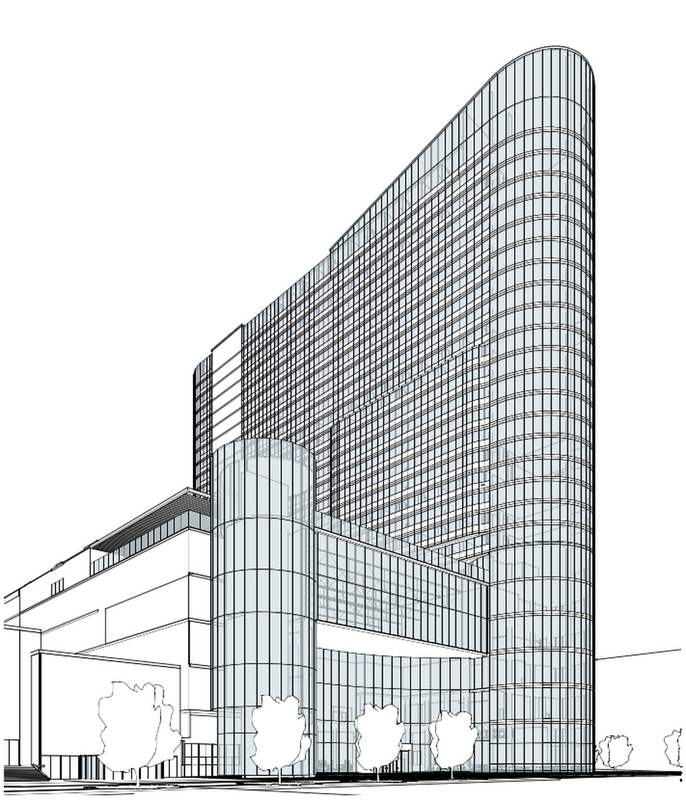 One will be a three-story-tall screen installed part of the way up the hotel tower on the project’s southeast corner, according to designs, and the west edge of the entrance will feature four smaller, stacked screens spread around a conical corner building, all facing 200 South.